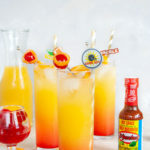 A tequila cocktail using El Yucateco Habanero Pepper sauce to make a spicy Tequila Sunrise. 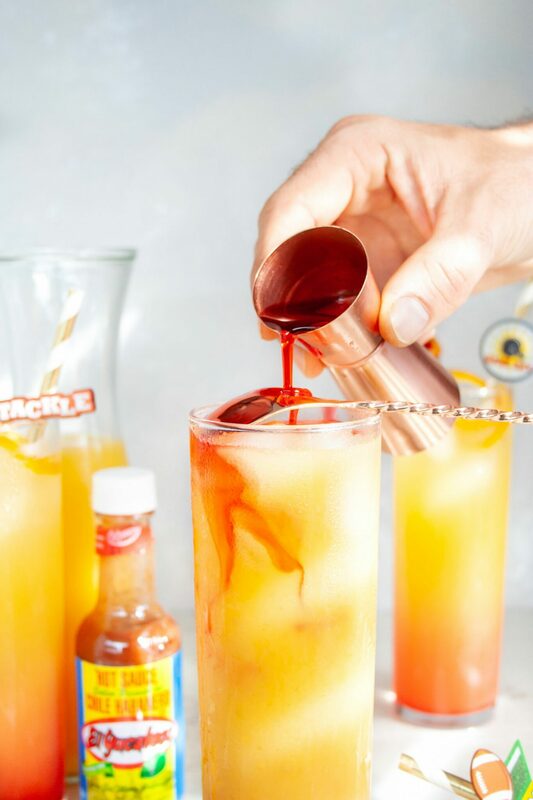 This game day drink is the perfect tailgate cocktail with only 4 ingredients! This post is sponsored by El Yucateco in correlation for their 50th birthday. For more information on sponsored content please see our Site Policies for further information. Recipe is for those ages 21+. When it comes to tailgating I’m not usually someone who likes to make things super complicated. I like big bold flavors but as easily as I can get them. This also including my game day drinks. I want something with minimal ingredients, even a drink I can prep ahead of time, and one that isn’t complicated to assemble. 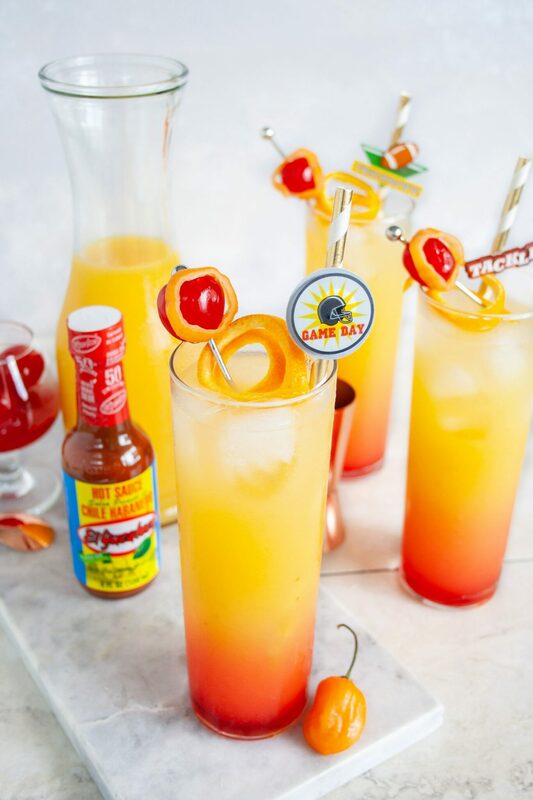 This Habanero Tequila Sunrise ticks all those tailgate drink boxes (or homegate drink boxes, if that’s you’re thing) and honestly, it may be better than the classic. 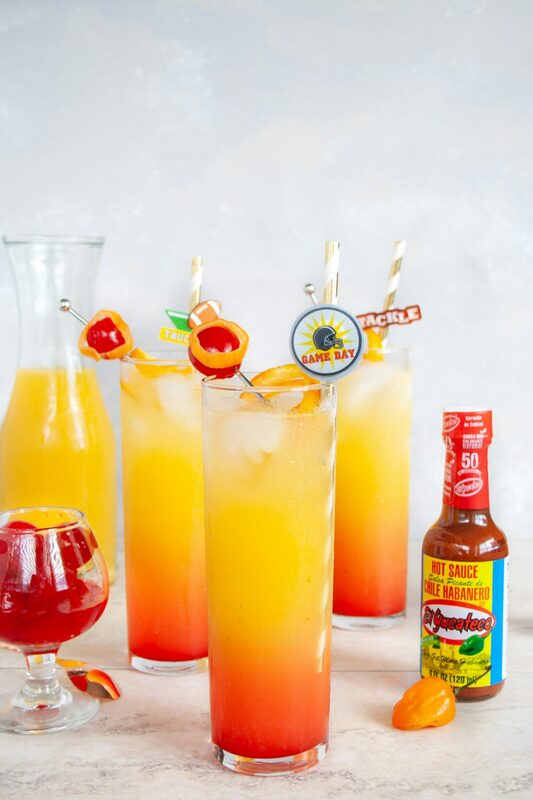 I use my favorite, El Yucateco Red Sauce Habanero Pepper to heat up the traditional sweetness of this drink for a sweet and spicy combo. Using only 4 ingredients to make it, this is about to become the touchdown of your next tailgate! So how hot is it? Starting off I will say I like things at a medium spice level. So for me 3 drops of El Yucateco Red Sauce Habanero Pepper is perfect with it’s habanero and tomato notes. Someone like my husband who loves extra spicy, could go for 5 drops. Start small and taste as you go, you can always add more later. 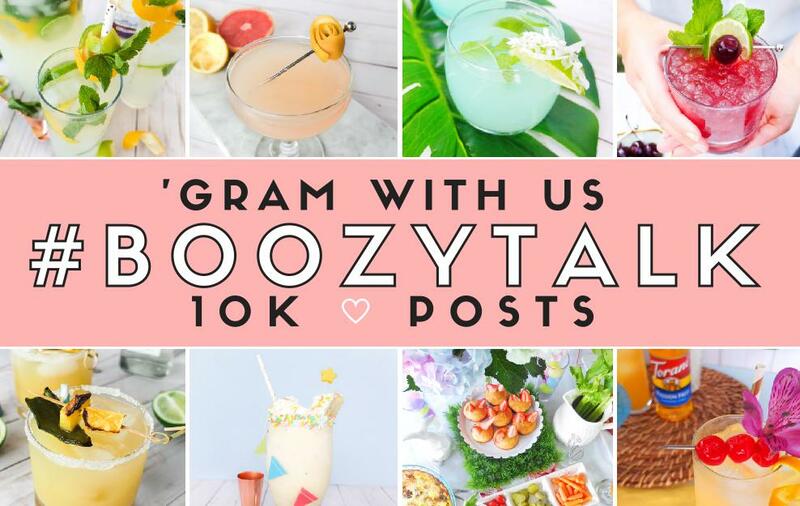 How easy is this cocktail? Into a pint glass or highball filled with ice add orange juice, silver tequila, and El Yucateco Red Sauce Habanero Pepper. Give it a stir with a bar spoon and if it needs more heat, add another drop or two in. Use the back of your bar spoon and press it up against the inside of the glass at the top. Pour your grenadine onto the back of the bar spoon and watch it sink down into the bottom of the glass giving it the sunrise look. After that garnish with maraschino cherries and habanero slices! What I love about this spicy cocktail is that you can make it ahead of time, almost like a punch. Just times the ingredient amounts* by how many cocktails you’ll need. Then combine the orange juice, tequila, and the El Yucateco Red Habanero Pepper Sauce in a jug. Then when ready to serve, set it out with ice, cups, and grenadine for easy assembly! *The pepper sauce I would start with 5 drops in a pitcher full and then build up. It won’t need to be Xs per cocktail as it will be too much! 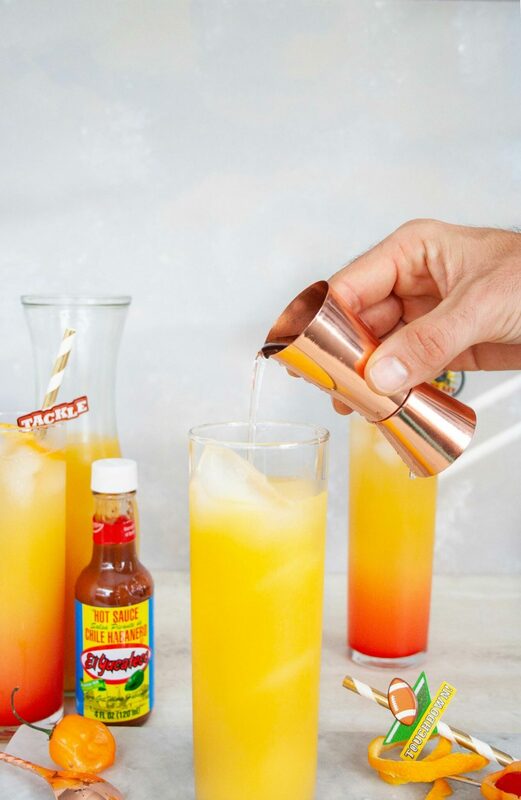 This spicy tequila cocktail using El Yucateco Habanero Pepper sauce to make a sweet and spicy take on a Tequila Sunrise. 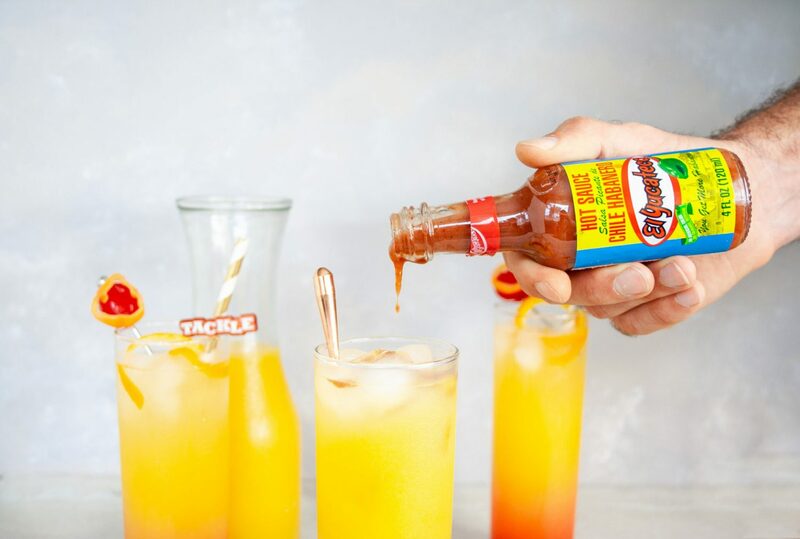 This game day Tequila Sunrise is perfect tailgate cocktail with only 4 ingredients and is easy to make ahead! 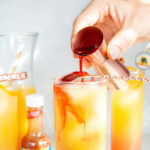 Into a highball or pint glass filled with ice add add tequila, orange juice, and El Yucateco Red Habanero Pepper Sauce*. Give it a stir to combine. Taking the back of your bar spoon turn it upside down and press it up against the inside of the glass. Pour the grenadine slowly over the back of the bar spoon and let it float down to the bottom. Garnish with maraschino cherries and habanero slices. *start with three drops of El Yucateco Sauce, give it a taste and build up the heat to your preference from there. Remember the grenadine will add an extra layer of sweet. 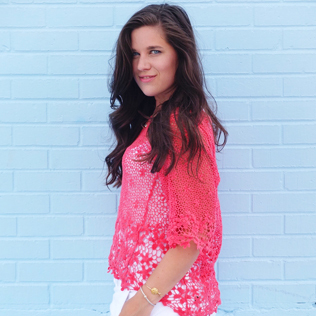 Talk about an easy but delicious tailgate drink recipe! We love a make ahead drink. Plus with it’s orange juice addition it makes for the perfect brunch cocktail for those early morning tailgates. El Yucateco is celebrating their 50th year, so if you are in the market to spice up not just your cocktails but your tailgate food, try one of their many flavors. I know we use their sauces on so many dishes from pizza to chili. You can also check out this Tiki Touchdown cocktail I made using their Green Chili Habanero Sauce a few years ago. Before you go, tell me, what do you sip on when you tailgate? Do you love a cocktail that can pack some heat? Gimme all your tailgate and spicy cocktail details down below.